Drafting, which will be on prominent display in Sunday's Daytona 500, is an interesting phenomenon. While it is fairly obvious how it helps the drafter, the rear car, it's not so obvious how it helps the car in front. But it does—it's a win-win, apart from the fact that if anything goes awry it can lead to disaster. The drag on a racecar is roughly the difference between the air resistance in the front, slowing the car, and the pressure behind the car, giving it a push. A car running by itself will generate turbulent air in the rear—which has the effect of reducing the helpful rear pressure, and thereby increasing the overall drag. When another car pulls up to the lead cars rear bumper, the effect for it is clear—the pressure on the front that second car is much lower because he is riding in the wake of the front car. 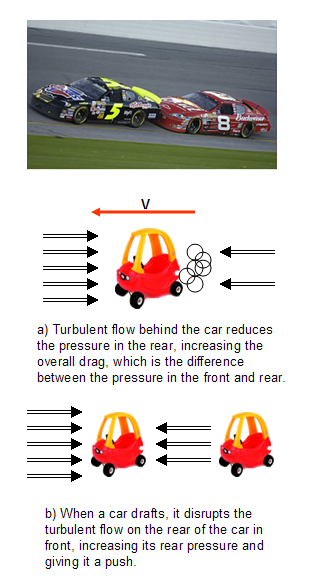 The benefit he provides to the lead car is this: he disrupts the turbulence behind the lead car, increasing the rear pressure, and thereby the lead car also experiences a net reduction in drag. A skilled driver in the second car can slingshot around the lead car by backing off just a bit—at some point while he is still getting most of the benefit of being in the first car's shadow, turbulence will be reestablished on the lead car, and it will slow down. At that instant the second driver can pull around. It sometimes works, and it sometimes results in a spectacular crash. PHYSICS QUIZ: Assume car in figure (a) is not only moving to the left but also accelerating to the left while on a straight-away. What is the direction of the frictional force between the car and the track surface? 1. To the left, in the direction of motion. 2. To the right, opposite to the direction of motion. 3. It cannot be determined from the information provided.